The entire cast. Photo by Diane Sobolewski. Sometimes you just want to have good time and The Drowsy Chaperone at Goodspeed through Sunday, Nov. 25 is providing that and more. Hunter Foster has ably directed this production which features a show-within-a-show. Most of his choices are excellent. It starts in an apartment – not a luxurious or stylish apartment – just rooms with a worn chair and end table and a small basic kitchen. Out comes Man in Chair – who serves as narrator and more. He’ll speak to us directly throughout the show, but now he tells us that he loves musicals and is, as he describes, a little “blue.” When that occurs he likes to play one of his many LPs of old musicals. He tells us he has a two-LP set of the complete Drowsy Chaperone, a little known 1928 musical; it even includes dialogue. As the overture starts, he gives us some background on the composers of the show and some gossip about some of the cast. He’ll tell us more as the show moves along. 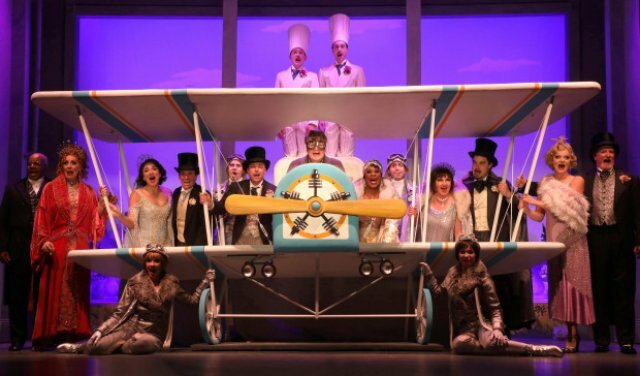 Suddenly the characters in the show are in his living room, introducing themselves to us; each is a typical musical comedy stereotype of the period. There’s the Broadway leading lady who is giving up the stage for love (and money), her fiancé, a producer who wants to stop the wedding, his ditsy girlfriend with aspirations of stardom, two gangsters representing the “boss” to whom the producer owes money, and a Latin lothario (Aldolpho). If that isn’t enough, there is the slightly bewildered older woman who owns the mansion and her butler as well as an aviatrix who just happens to drop in. According to the Man, the star of the show was beloved leading lady who plays the chaperone, gets drowsy when she drinks, which is often. Hence the title of the show. The plot features the usual complications – the gangsters threaten the producer, the producer urges Aldolpho to seduce the bride, but instead he seduces the chaperone. The bride meets the groom who is blindfolded and on roller skates (don’t ask why) and pretends to be a French girl. When he briefly kisses her, the wedding is off. As this is all occurring, the apartment becomes mostly the set of the musical. What elevates this are the comments and obvious enthusiasm (perhaps too much in this production) of the Man. He sets the stage, he tells us bits about the performers. The gangsters were the dancing stereotype frequently in shows of the period. The star, the drowsy chaperone had to have a big rousing number in each show. Aldolpho was played by an over-the-hill actor who liked to drink. Even the lady of the manor, Mrs. Totterdale and Underling (her butler) were a vaudeville team that might be reminiscent of Burns and Allen. He gets so excited that occasionally he actually joins the cast in humming a few bars or doing a few dance steps; sometimes he even lifts the needle the record (the performers freeze) to give us more info. Yet, he is more than just a narrator – we also learn more him, he’s a lonely middle-aged man who finds solace in his LPs. John Scherer turns the Man into the leading role of the piece. He projects warmth and pain, and makes it seem like he is truly having a conversation with us. His performance is much more animated than some I’ve seen; you may love it or you may find it way too much. I’m somewhere in the middle, I liked it a lot but wished it was toned down just a tad. By the way, on Broadway, Bob Martin, the co-book writer played the part. Scherer’s performance results in attention being diverted from the characters in the musical. Each is good and each creates his or her own take on the characters. It is very hard to single one or two out – this is truly an ensemble. Stephanie Rothenberg as the bride (actress Janet Van de Graff) had the most difficult job: I’d seen Sutton Foster in the role who just glowed on stage. Rothenberg doesn’t have the same star power, but her Janet is touching and funny. Robert Alves plays the fiancé, Robert as the superficial character he is with gleaming teeth. He, George (Tim Falter) the best man and of course the two gangsters have terrific tap numbers choreographed by Chris Bailey. James Judy plays the producer Feldzieg (a play on Ziegfeld) as a typical producer and Ruth Pferdehirt has Kitty, his ditzy chorine girlfriend down pat. Jennifer Allen is excellent in the role of the Drowsy Chaperone, not over playing the inebriation. As usual the Goodspeed production qualities are excellent. The scenic design by Howard Jones captures both the apartment and the multiple sets of the original musical. Gregg Barnes has overseen the costumes which include many from the Broadway production. He won a Tony for them and you can see why; they are glamorous and over the top. (Goodspeed had acquired the costumes for its collection when the Broadway show closed). Perhaps one of the goofiest and yet most fun moments, comes at the beginning of the second act. Suddenly we are seeing a number from musical set in the Far East. I won’t spoil the surprise of why that occurs.